The author shares more than 120 recipes that are both good-looking and tasty. Babies begin to have solid food and nutritious meals when they are around one year old. Eating habits developed from 1 to 6 years old will play a vital role in their physical conditions for a lifetime. Thus, we must find out their tastes, know about what and how they should eat before making them love to eat. Under the pseudonym of Breeze Kitchen, The author shares more than 120 recipes that are both good-looking and tasty, including breakfast, homemade pastry, low-fat baked food, party snacks and creative Western food. The delicious foods in interesting shapes are easy to prepare. 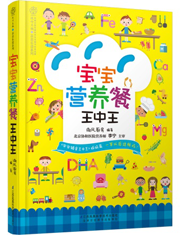 Each nutrimeal recipe for kids in the book has gone through careful examination by Li Ning, a doctor at the Nutrition Department of the Peking Union Medical College Hospital.